Until the widespread use of photography, and most particularly until the advent of the zoom lens, landscapes came as you saw them. A few were privileged enough to possess optical instruments like telescopes, but the great majority of people could only see what they saw. If you wanted to ‘zoom in’, you had to walk closer; if you wanted a broader view, you had to walk away and find a vantage point. The notable exception to this was in landscape paintings, where a diligent painter could depict details which you could only discern by getting close to their painting. 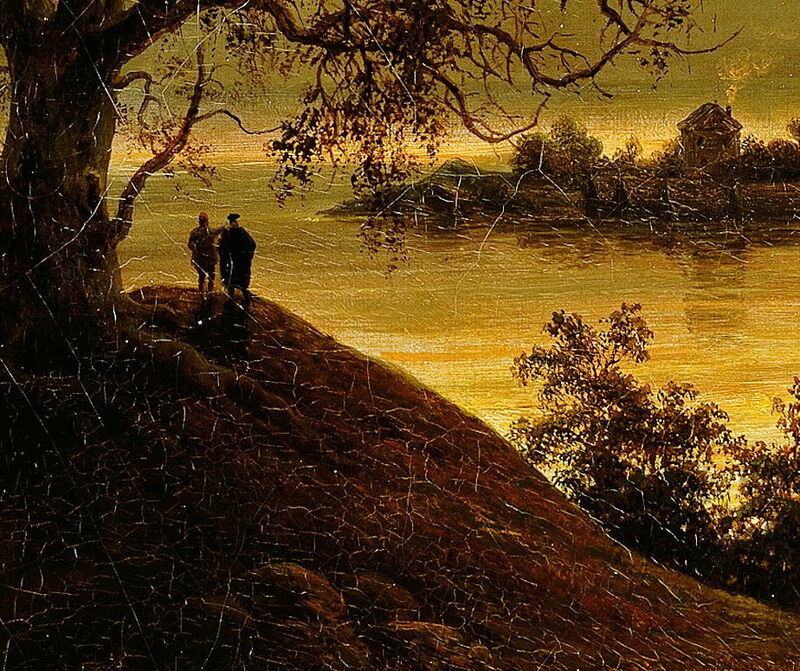 Figures and similar small details could therefore be introduced into a landscape painting to lure the viewer to study its fine details, and to marvel at them: figures on the other side of a fjord, perhaps. In luring the viewer in this way, an artist could get them to look at their work intently. We still do the same with our children: illustrated children’s books which feature a recurrent figure, like Richard Scarry‘s Goldbug series, teach us to look long and hard at images in much the same way. Some of the best examples of this use of figures in the landscape come in the magnificent paintings of Thomas Fearnley (1802-1842), a Norwegian painter whose career was cut short when he died of typhus at the age of only 39. Fearnley was one of the most brilliant exponents of plein air painting in oils when Corot was also painting in the Roman Campagna. His sketches made in front of the motif and subsequent finished paintings are rich in their use of figures, among them an artist, often seen sitting at an easel painting the view depicted in the painting: Fearnley’s graphical signature. By all accounts, Fearnley himself was a portly man, who would have looked quite different to the figures which keep appearing in his paintings. It seems reasonable to conclude that this traveller, viewer, and artist was Fearnley’s artistic alter ego, a rückenfigur seen in paintings by the likes of Caspar David Friedrich. 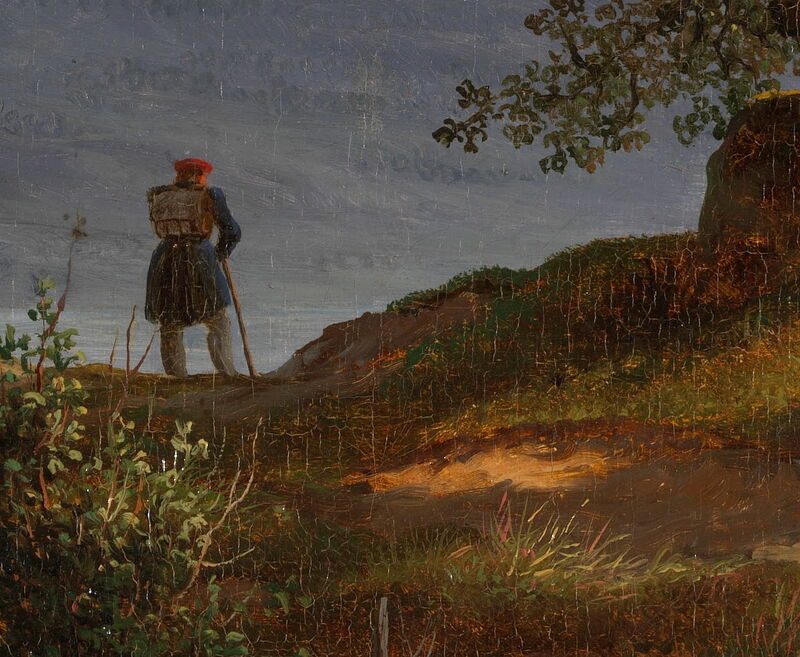 He often appears wearing a distinctive hat – sometimes a top-hat, or the red cap of Landscape with a Wanderer (1830), shown in the detail below. Thomas Fearnley (1802–1842), The Painter and the Boy (c 1834), oil on paper mounted on canvas, 26.5 × 37 cm, Nasjonalgalleriet, Oslo. Wikimedia Commons. A couple of times, Fearnley’s painter assumes great importance, as in The Painter and the Boy (c 1834) above. 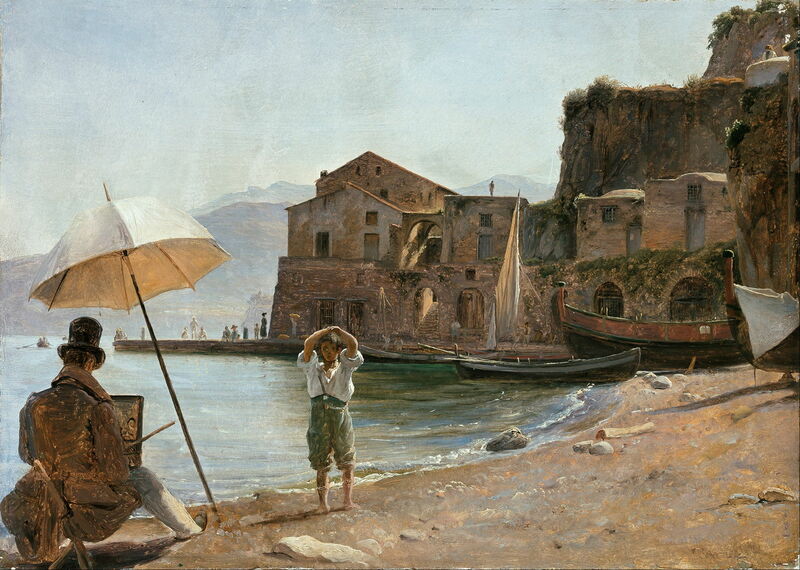 This view of the Italian coast was most probably painted en plein air over a period of a few days, the figures being added late during that process. The artist with his back to the viewer doesn’t appear bulky enough to be Fearnley, cannot be identified as any real painter, and must be presumed to be this alter ego. If the Painter and the Boy themselves are part of the motif, Fearnley still adorns the ground with accessories. The detail below shows well over a dozen, each carefully worked during the limited time available for this painting. 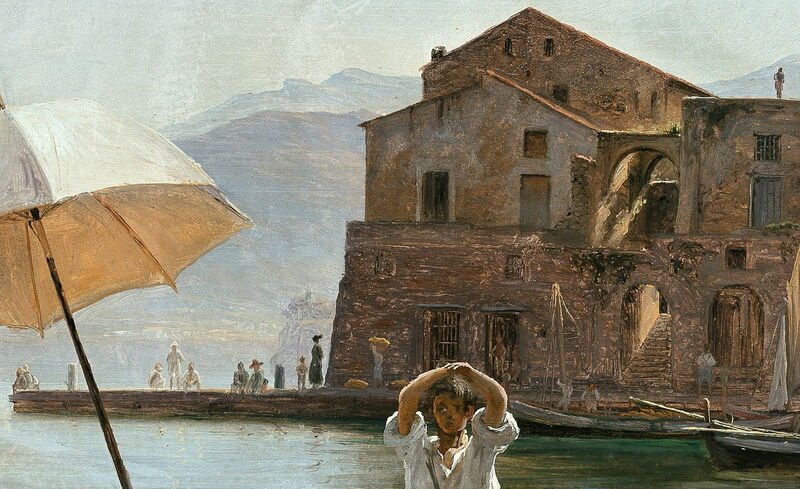 Thomas Fearnley (1802–1842), The Painter and the Boy (detail) (c 1834), oil on paper mounted on canvas, 26.5 × 37 cm, Nasjonalgalleriet, Oslo. Wikimedia Commons. We get even better insight into Fearnley’s use of figures when comparing one of his plein air sketches with its matching finished work. 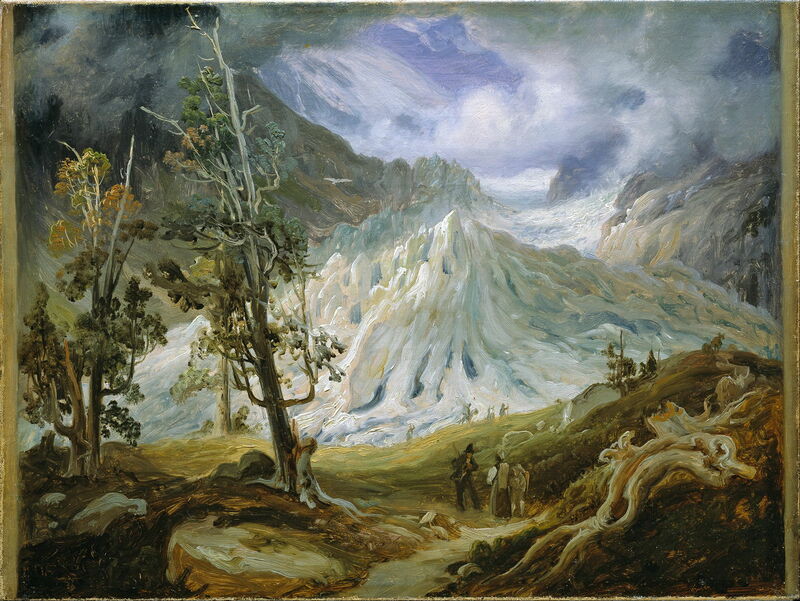 Thomas Fearnley (1802–1842), Grindelwald Glacier (1, sketch) (c 1837), oil on canvas, 31 × 40.5 cm, Nasjonalgalleriet, Oslo. Wikimedia Commons. During his travels in about 1837, Fearnley visited the Grindelwald Glacier, and produced this superb plein air oil sketch. In addition to the ghostly-white eagle soaring above the ice, he included more than half a dozen figures, shown in the detail below. 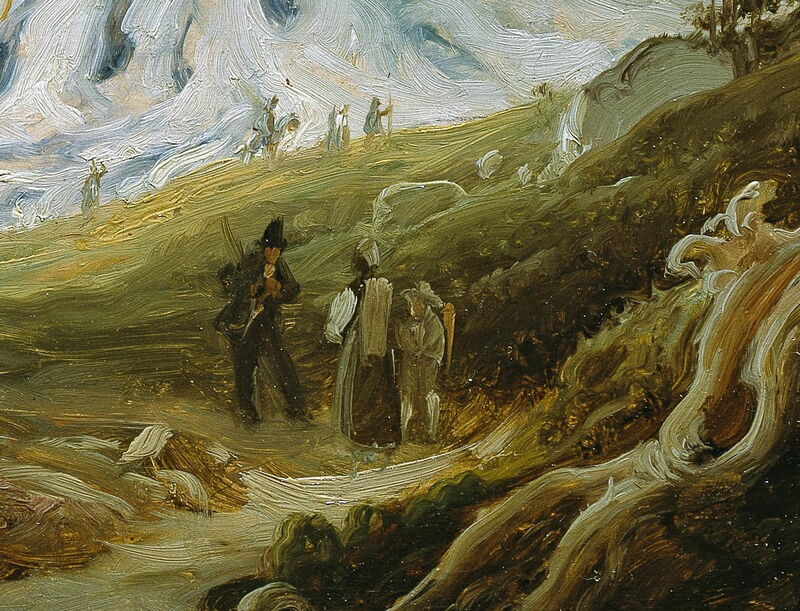 Thomas Fearnley (1802–1842), Grindelwald Glacier (1, sketch) (detail) (c 1837), oil on canvas, 31 × 40.5 cm, Nasjonalgalleriet, Oslo. Wikimedia Commons. Prominent among the nearer group is a walker, wearing a large black hat. Even the line of people far back against the foot of the glacier has been painted in some detail, though, with the leader holding a staff, and one of them mounted on a pony or similar. 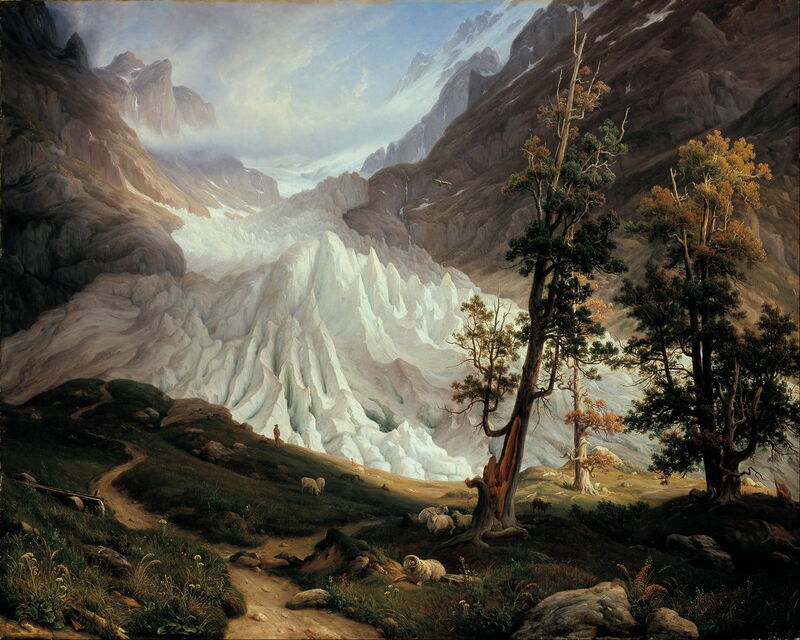 Thomas Fearnley (1802–1842), Grindelwald Glacier (2) (1838), oil on canvas, 157 × 194 cm, Nasjonalgalleriet, Oslo. Wikimedia Commons. A year or so later, Fearnley painted this large finished version. The method he used to transfer from his original sketch has reversed the sides of the image, but many details have been retained. The eagle still soars, the trees are very similar, but the figures have changed completely. 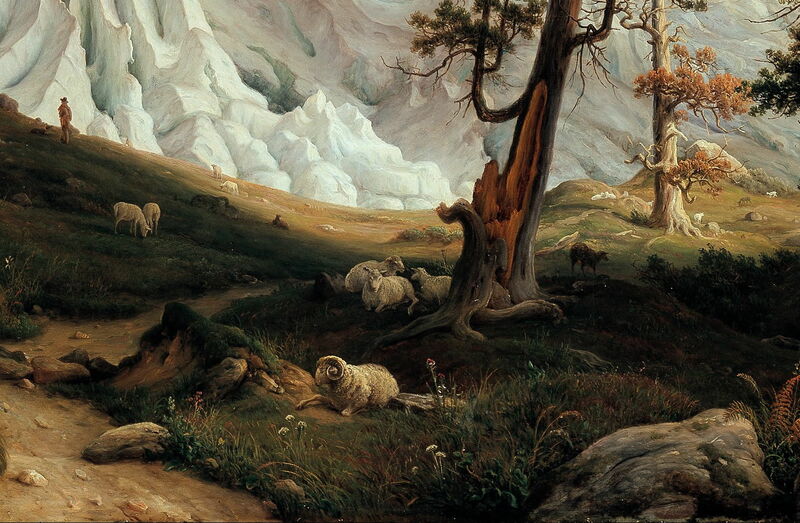 Thomas Fearnley (1802–1842), Grindelwald Glacier (2) (detail) (1838), oil on canvas, 157 × 194 cm, Nasjonalgalleriet, Oslo. Wikimedia Commons. On the now lush pastures in front of the massive wall of ice, Fearnley has found a flock of sheep instead of people. In the distance, with his back towards us, is the rambler, posing as shepherd but looking away from the viewer, towards the glacier, and wearing a distinctive black hat. 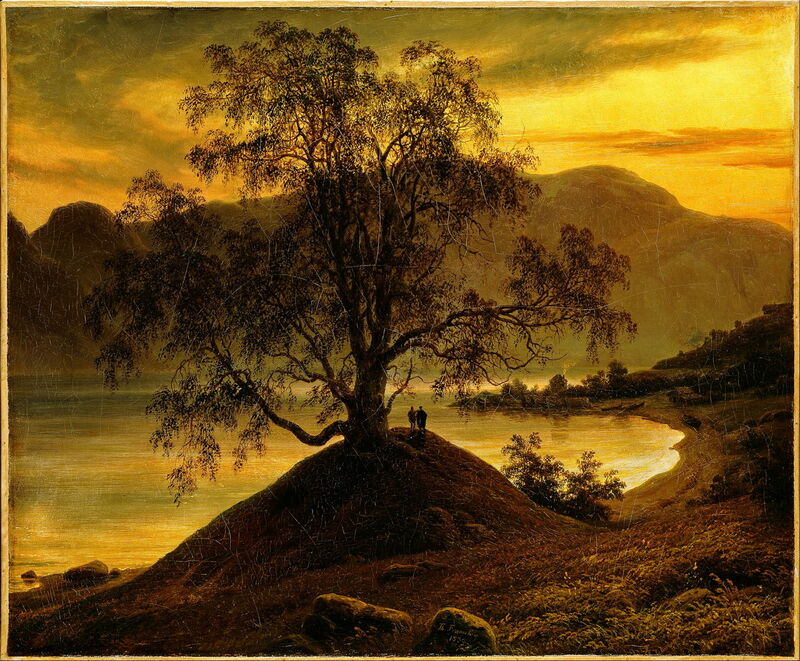 Thomas Fearnley (1802–1842), Old Birch Tree at Sognefjord (1839), oil on canvas, 54.5 x 66 cm, Nasjonalgalleriet, Oslo. Wikimedia Commons. 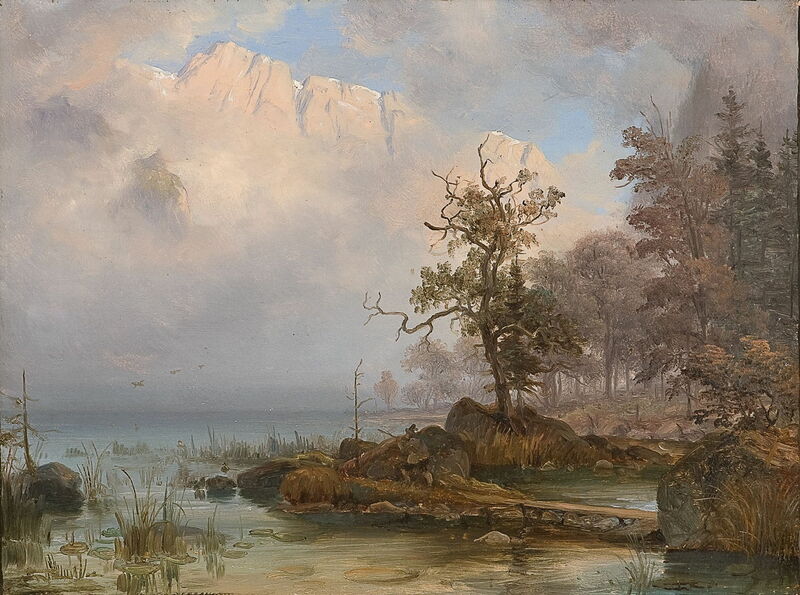 Old Birch Tree at Sognefjord (1839) features two small figures at is centre, and many other absorbing details such as the smoke rising from the chimney of the house on the other side of the small bay. Look closer, at its detail (below) and both figures wear hats, the one on the left being bright red. 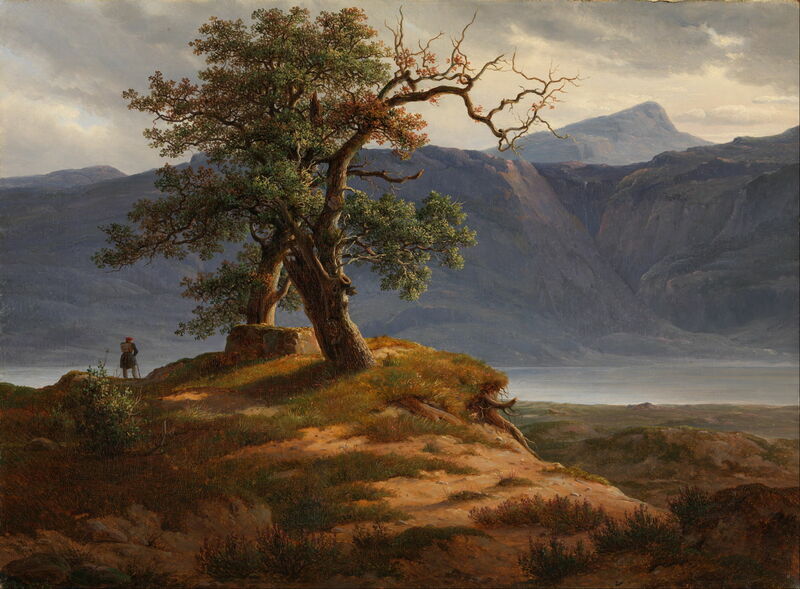 Thomas Fearnley (1802–1842), Old Birch Tree at Sognefjord (detail) (1839), oil on canvas, 54.5 x 66 cm, Nasjonalgalleriet, Oslo. Wikimedia Commons. Fearnley draws the viewer closer and closer into his paintings. Thomas Fearnley (1802–1842) The Duck Hunter (date not known), oil on paper mounted on panel, 32 × 42 cm, location not known. Wikimedia Commons. In The Duck Hunter, the figure is camouflaged to increase the challenge made of the viewer. This is heightened in another large finished work, showing The Labro Falls at Kongsberg (1837), below. 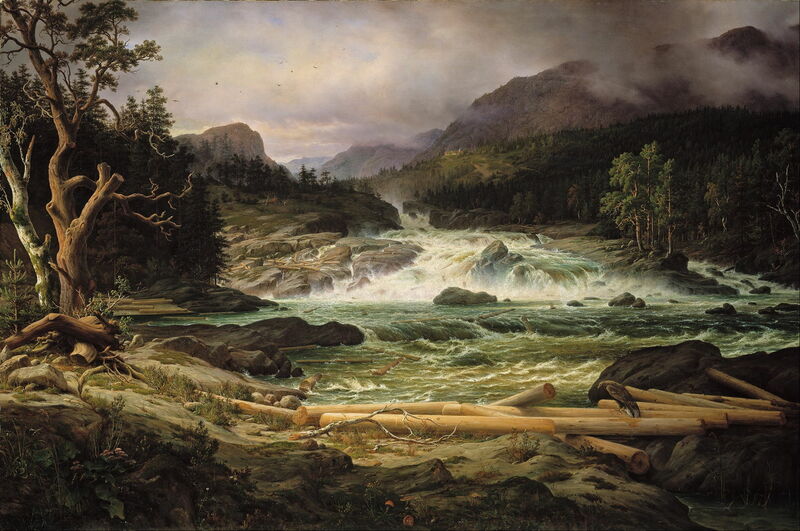 Thomas Fearnley (1802–1842), The Labro Falls at Kongsberg (1837), oil on canvas, 150 × 224 cm, Nasjonalgalleriet, Oslo. Wikimedia Commons. You don’t get many points for spotting the large eagle in the foreground, or the scattered fungi. Rewards increase with the birds wheeling in the sky, and the cabin in the middle distance. 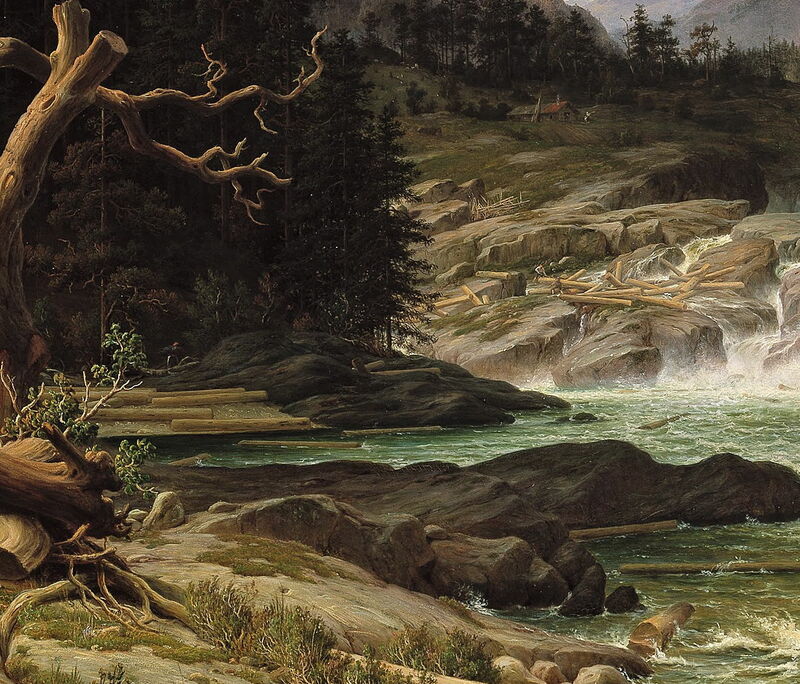 Thomas Fearnley (1802–1842), The Labro Falls at Kongsberg (detail) (1837), oil on canvas, 150 × 224 cm, Nasjonalgalleriet, Oslo. Wikimedia Commons. To get full marks, you have to notice the tiny red cap among the shadows, to the left of centre in this detail. I think that is Fearnley’s alter ego, collecting brushwood for the fire in his cabin in the upper right. Fearnley is by no means the only landscape painter to have used such little figures to draw the viewer into their highly detailed landscapes, and make them marvel at seeing what they could not have seen in reality. It’s a very effective trick which adds interest to a view, and enriches the dialogue between the artist and viewer. The people may be little, but their purpose is as ambitious as the grander landscape around them. Sumner, Ann, and Smith, Greg (eds) (2012) In Front of Nature, The European Landscapes of Thomas Fearnley, Barber Institute of Fine Arts. ISBN 978 1 907804 10 6. Posted in General, Life, Painting and tagged Corot, Fearnley, figures, Goldbug, landscape, Norway, painting, plein air, Scarry. Bookmark the permalink.